These two drawings from the May 1974 issue of The Vineyard show our former and current church buildings: on the left, the church at 309 Central Avenue, built in 1885; on the right, the church at 1521 N. Patterson Street, built in 1948. A gift of $1,200.00 from an unknown lady of Savannah was given to the Diocese of Georgia to build an Episcopal Church in Valdosta (History of Lowndes County). This led to the original church at 309 Central Avenue in 1885 and to the present location of Christ Church on Patterson Street in 1949. Two conflicting dates are recorded for the purchase of the church property. The Diocese of Georgia which met in Convention reported that a lot had been purchased, building started, and $100.00 raised for missions in Valdosta as early as 1871 (Malone). The History of Lowndes County uses 1885 as the time of purchasing the lot on Central Avenue. The earliest services were held by traveling clergy from the Dioceses of Georgia, Florida, Alabama and Mississippi. Before 1885 The Rev. Samuel Benedict, rector of St. John’s, Savannah, and Archdeacon of South Georgia held services in private homes and in the Court House on an irregular basis (Louttit). The Rev. H. B. Stuart-Martin who also had two other charges in South Georgia became the first Vicar of Christ Church. Using money saved by two families a lot on E. Central Avenue was purchased from Mrs. Joshua Griffin for $250.00. The cornerstone was laid on November 7, 1885 and the first service was held in February the following year. Charter members were Mrs. Edward Wilson, Mrs. James Farr, Mr. and Mrs. Charles Stuart, Mrs. Juliet Ashley, and Miss Virginia Ashley. On December 13, 1887 Bishop Weed of Florida consecrated the chapel (History of Lowndes County) . The first Vicar to live in Valdosta was The Rev. F. B. Ticknor who came in 1892. A Sunday School was organized with fifteen pupils and two teachers. Colonel Powhattan Whittle, a lawyer, donated a lot on Ashley Street and the newly consecrated Bishop of Georgia visited Valdosta and loaned the congregation $360.00 to build stores on this property for the rental income. In the same year, Mr. Charles Thompson, a partner in Thompson-Girardin Jewelry Store, moved to Valdosta. He served on the vestry and was the organist for fifty years (Mundy). In 1894 the women of the church organized into a Guild to support the church. Mrs. Lucian Lamar became President and remained in that position for six years. Mrs. Crom was Vice President, Miss Elinor Hampton, Secretary and Miss Powell Treasurer. The ladies in the Guild had many activities to raise money. Mr. Barnett, the Valdosta Police Chief and Mr. Louis Strom helped the ladies by finding tenants and collecting rents for the stores. The money leant by the bishop plus seven per cent interest was repaid in three years (Louttit). By 1894 the Sunday School had grown to four teachers and twenty pupils . In 1896 a baptismal font was purchased. The Rev. G. A. Ottman organized the Vestry in the fall of 1900. he is best remembered for starting the Elks Club in Valdosta. In 1901 the women bought hymnals and book racks. A new choir was organized by Miss Dew. A reed organ was purchased. $200.00 was raised by the Guild towards the Vicar’s salary. Some of the women’s projects were sewing bees, teas, and cake walks. (Mundy). In 1903 Mrs. J. L. Staton became the first president of a new guild, the Needle Woman’s Guild. This eventually became the Altar Guild which exists to this day (Louttit). In 1904 The Rev. G. S. Whitney of Thomasville and The Rev. Cassill, Archdeacon of Savannah, held services at the mission church until a new Vicar was appointed. The Rev. R. G. Hamilton served from 1905-1908. During his ministry the first confirmation service was held on December 17, 1905, with The Right Rev. C. K. Nelson officiating. Five people were confirmed: Margaret Jane Simons, Atossa Faires Oemler, Pearl Laurie Lewis, Carol Lavina Lewis, and Florence Elizabeth Green (History of Lowndes County). In 1907 the Episcopal Church of Georgia was divided into two dioceses, the Northwestern and the Southeastern. 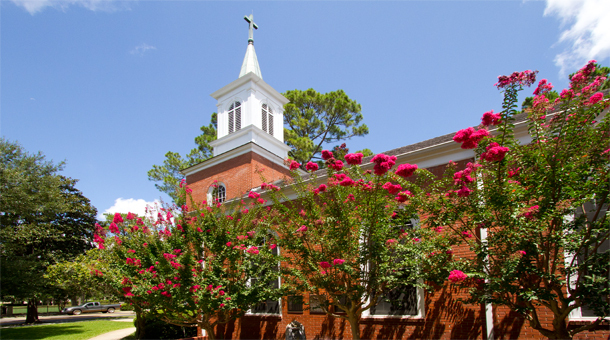 Christ Church, Valdosta was one of the 24 churches in the Southeastern Diocese. Christ Church was listed as an organized mission with 33 communicants on January 1, 1908 (Malone). The rental property was sold in 1910 and a vicary was built at 105 W. North Street. Many improvements and gifts were added to the church. nave of the church was enlarged. Carpeting, painting and the installation of electric lights and an altar curtain were provided by monies raised by the Guild and by individual gifts (History of Lowndes County). The exterior was stuccoed in 1910 (Mundy). The ladies sold fifty dolls and bought a brass cross and vases for the altar. The communion service was a gift from the Guild of Christ Church Savannah and the brass candlesticks from Bishop Nelson. Guild members included Mrs. A. T. Woodward, Mrs. Lassiter, Mrs. James Briggs, Mrs. Upson, Sr., Mrs. J. L. Staten, and Mrs. Howard Dexter (History of Lowndes County). The Rev. J. J. Cornish served Christ Church from 1917-1932. Under his leadership the choir was vested for the first time on Easter Sunday 1921.. The Guild started a Parish Hall Fund but this was later changed to an Organ Fund. The first adult Bible class was organized in 1924. In 1926 North Street was paved and the mission had to pay for the paving in front of the vicary. Two years later the Guild helped supplement insurance money to replace the vicary roof damaged from a fire (Louttit). The next Vicar, The Rev. A. T. Eyler who came in 1932, bought electric light fixtures to replace gas fixtures in the vicary. Gas heaters were installed in the church in 1935. A pulpit was bought in honor of the Rev. Cornish (Louttit). The Rev. Thomas Mundy became the Vicar of Christ Church Valdosta and St. James, Quitman in 1936. Of twenty families, ten pledged $865.00 in 1937. By 1940 32 pledged $1,476.00. By the end of World War II there were 80 communicants, ten in the military. The Men’s club was started March 3, 1946. Mr. Jerome Tillman was the first president. The church was enlarged with space for new choir stalls. Land was purchased for a parish hall next to the church, but when an automobile firm was established near that location, the congregation decided to move (Louttit). Clifton Hunington White, a professor of Fine Arts and Biblical Archaeology at Georgia State Women’s College and an communicant of Christ Church, studied under Mr. Mundy becoming a Deacon, April 29, 1945, and a Priest, March 16, 1946. On January 1, 1946, a property on the corner of Patterson and College Street was purchased for $6,000.00. The newly ordained Mr. White resigned his teaching position to become the next Vicar of Christ Church in June, 1946 (Louttit). The Valdosta Daily Times reported on October 22, 1946, that Christ Church planned to raise $25,000.00 to match funds provided by the Diocese of Georgia to build a new church. The Editor, Turner Rockwell, urged the community to help with the worthy cause. In September 1946, the church building on Central Avenue was sold and deconsecrated the following year. All the church articles were put in storage at the college and for fourteen months services were held in one of the classrooms. The Ground Breaking Ceremony was on May 3, 1948. The original cornerstone of 1885 was removed from the Central Avenue building, recarved and laid at the new location on September 10, 1948 (Louttit). The opening dedication service was held at 10:00 on February 20, 1949, followed by Holy Eucharist at 11:30 and Choral Evensong at 5:00 p.m. The Atlanta Journal reported that the main building was designed similarly to the Bruton Parish Church in Williamsburg, and that the tower was an adaptation of a Wren steeple. Total Church construction was $73,000.00. The altar, brassware, baptismal font, Litany desk, communion silver, pipe organ, processional flag, and cross used in the original building were all taken out of storage and used in the new sanctuary (Louttit). By 1950, the 55 members of the Women’s Auxiliary spent over $3,000.00 for tables and chairs for the Church School and parish hall plus furnishing the kitchen with stove, refrigerator, silver, and dishes. This amount did not include monies raised for local and Diocesan missions (Parrish). The Rev. Michael Kippenbrock became Vicar on May 1, 1953, receiving a salary of $4,800.00. Barnwell Hall, a classroom wing, was added to the parish hall and dedicated in March of 1954. On May 11, of the same year Christ Church was admitted to the diocese as a parish. The Rev. Kippenbrock was appointed the first Rector. The church which had been a mission for so many years was now self supporting. (Louttit). The property next to the church on College Street was purchased in 1959. Named Stuart Hall the building was renovated for an office and classrooms for Sunday School and a weekday kindergarten. To help pay for the new property the women’s Auxiliary ran a thrift shop for seven years (Louttit). By 1963, there were 250 communicants and another renovation project was begun with Blake Ellis as architect. The Rev. Kippenbrock moved to Florida and The Rev. Ernest Stires served as Interim Priest until August 1, 1964, when The Rev. Brevard Springs Williams, Jr. became the Rector. He served until September, 1966, and The Rev. Stires again served as Interim Priest. The Rev. Henry Irving Louttit was installed as the third Rector of Christ Church on April 1, 1967 (Louttit). This chapter contains excerpts from The Vineyard, the monthly newsletter from Christ Church which highlights many of the activities of the past 22 years. From a church which started with a few families in 1871 Christ Church has grown to include 60 children and 340 communicants. On Sunday mornings there are three services offered as well as Sunday School classes. Three weekday services are held in addition to many activities for study and fellowship. Following are lists showing the activities and outreach of Christ Church at this time. History of Lowndes County, Georgia, 1-825-1941. Valdosta: General Jackson Chapter, D.A.R., 1942; reprint Spartansburg, S. C.: The Reprint Co., 1978. Louttit, Henry Irving, Jr. “History Christ Episcopal Church Valdosta, Ga.” Vineyard, May, 1974. Malone, Henry Thompson. The Episcopal Church in Georgia, 1733-1957. Atlanta: Protestant Episcopal Church in the Diocese of Atlanta, 1960. Mundy, Thomas, Jr. “History of Christ Church Valdosta, Ga.” 1943. Parish Register, Christ Episcopal Church, Valdosta, 1885-1904. Parrish, Mrs. Ansel A. III, “The Story of the Women of Christ Church Valdosta,” The Church in Georgia, Vol. 18. No. 5-6, June-July, 1952. Vineyard April, 1967 – June, 1989. This entry was posted in History of Christ Church on July 26, 2011 by jariail.